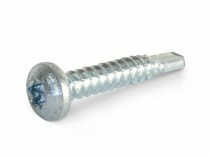 A range of pan head self drilling tek screws, for light duty metal to metal fixings. Tek screws eliminate the need to pre-drill the hole, meaning they are much faster than traditional self tapping screws which require pilot-drilling. Tek screws are best fitted with an impact driver. Available in pozi drive, or a torx drive for high torque applications.